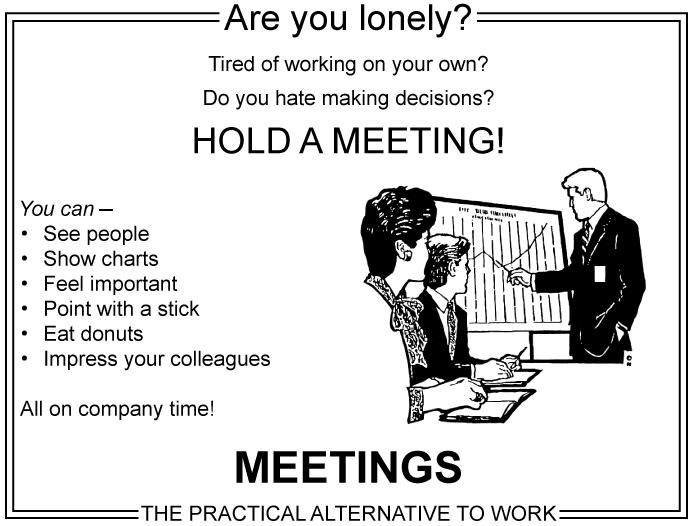 Are the meetings you’re participating in productive? How do you know? From the halls of corporate giants all the way down to the co-working spaces and coffee shops of startups and micro-businesses, a popular refrain can be heard: “Meetings are a waste of time”. Is that you? Well, most of the time, you’re right. They are. But that doesn’t say something about “meetings” as a whole, it only says something about the ones you’ve been having. Meetings can be highly productive, crucial in fact, and even enjoyable. So, what makes a meeting (or any less formalized conversation, for that matter) “productive”? Commitment(s). You can assess a meeting by the action produced that otherwise was not going to happen (or would not have happened as quickly and/or effectively). And how do you produce new actions, new relationships, new conditions? Commitment. In fact, commitment itself is an action. See, there’s a kind of language, of speaking, that is quite distinct from other kinds in that it is not meant to describe or explain or represent– it is actually an action, in and of itself. Appropriately, this is called a speech act, and includes acts like promises, requests, assertions, and declarations. So, the first thing to get clear is, what is the point of the meeting? What intention or commitment is the conversation supposed to be moving forward? Having all parties clear on the common commitment goes a long way toward creating an effective agenda and having a relevant and productive conversation. Then, get clear and specific and committed. If you’re intending to deal with some issue or problem, it sure can be easy to drown in a sea of opinions– various people holding so rigidly to their already-established views of the situation (often as a way of defending themselves from being wrong or at fault) that all well-intentioned efforts to gain consensus, agreement or movement of any kind are hopelessly doomed to failure, over and over and over. Cut the opinion-airing short. Allow people to present their assessments, so long as they’re grounded with the assertion of a pattern of verifiable events/results/ happenings (plausible, objective evidence). Ungrounded opinions and unfounded speculation are rarely, if ever, productive. As grounded assessments are given and heard, new perspectives and new pathways for action may emerge. Have someone propose/offer a solution (that that person is willing to be responsible for). Then limit the responses to two possibilities: accept or counter-propose. Give everyone (with some say or accountability in that matter) the opportunity to respond (in one of those two ways). This facilitates a certain level of velocity, as well as allowing people to really own their contributions and be rewarded/acknowledged for their level of accountability and intentionality. stop tolerating bad meetings and take responsibility for moving matters forward with the (deceptively simple) power of commitment. Get committed, get productive, get going. For a brief guide on what is and isn’t an actual commitment, and how to avoid the negative impact of confusing the two (and it’s happening to you all the time), stay tuned. I think it’s important to make a distinction between meetings that are held for the purpose of reaching consensus on an issue and meetings that are held for the purpose of soliciting advice and opinions on an issue that will be decided by someone in a leadership role. There are also meetings that are simply information sharing among team members on a shared project, which help individuals advance their own parts of the shared project. In my experience, the role of leadership is crucial in any of these formats. If you don’t know where you want the meeting to go (not the specific conclusions that will be reached, but the questions that need to be answered) it will probably go nowhere, and your team will feel less secure with your leadership than if you give clear direction, draw out valuable views, and minimize unproductive digressions.